No, “turning a corner” isn’t a metaphor for something more profound, this is actually about turning a corner, and how people in Edmonton don’t know how to do it. I’m so tired of people nearly driving into me that I need to vent, and I’m doing that in this blog post. For whatever reason the people of Edmonton can’t follow the lines on the road and they turn into the middle lane, not the inside lane where they should be. This results in two cars going into the same lane, and an accident if people aren’t paying attention. 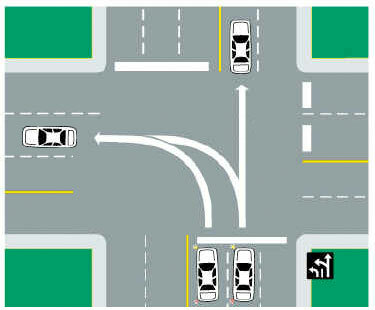 Luckily I haven’t been hit yet, but I’m always aware of the other cars around me, and I enjoy using my horn.I often see the driver in the middle lane turning into the outside lane as well, and this is also incorrect because that lane should be free so cars facing South can make a right-hand turn. 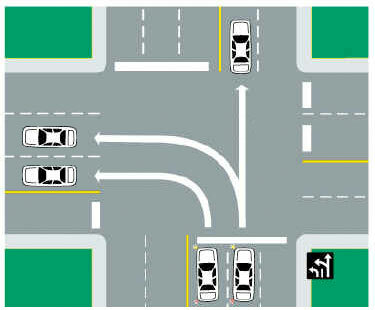 So next time you make a left-hand turn, please be aware of which lane you’re turning into. I’d hate to run into you. Thanks for reading my rant. What drives you crazy when you’re on the road? My husband who yells at the all the bad drivers especially the ones who can’t turn properly! I completely agree with you, Gord. And as this particular city’s streets get busier, it seems to me that following these kinds of rules becomes infinitely more important to ensure the flow of traffic and everyone’s safety. I’ve had a few near misses myself, and it only seems to be getting worse.